Practical working files further enhance the learning process and provide a degree of retention that is unmatched by any other form of Budgeting for Your Business tutorial, online or offline… so you’ll know the exact steps for your own projects. The first question any investor will ask of a business owner trying to raise cash is: What are you going to do with the cash once you raise it? The answer should be: It’s right here in the company’s budget. 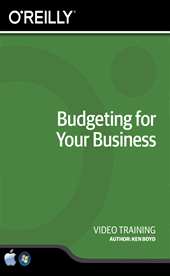 Budgets are a key component of any business plan, but too often they are neglected or rushed and not thorough enough. Bad budgeting can really hurt business development. In this video, Ken Boyd shows you how to create budgets that make sense to investors (and creditors) and provide you with the hard data you need to keep your business running successfully. Ken Boyd has over 30 years of experience helping companies create budgets, make decisions about long-term financing, and evaluate how to raise capital. Ken is a former Adjunct Professor at St. Louis University who creates books, podcasts, blogs, articles, and lectures on accounting and finance. He is author of the O’Reilly title Understanding an Income Statement as well as Cost Accounting for Dummies, The CPA Exam for Dummies, and 1,001 Accounting Questions for Dummies.